It’s that time of year again! The Festive Christmas Season is back at the Pan Pacific Vancouver. Our absolutely favourite time of year. Our house is festooned with decorations, our staff are merry and delicious comfort food is served at Oceans 999 and Coal Harbour Bar all season long. This year the Hotel is offering up plenty of choice events! An Oceans 999 tradition, celebrate the season with our tantalizing luncheon buffet, accompanied by our pianist. Perfect for corporate luncheons and celebrating with friends and family. Holiday magic and heavenly music unite with an elegant, yet extravagant, display of traditional cuisine. A unique way to entertain family, friends or colleagues. Our sensational market brunch filled with heart-warming festive cheer! Children can revel in exciting events planned just for them: a special children’s buffet, face-painting, balloon artistry and of course, a visit from Santa Claus himself! Experience the magic of the winter holidays and join us for an unforgettable Christmas Eve at your home away from home. Our home-made dinner buffet with a wide variety of delights, including traditional favourites; accompanied by all the Christmas Classics performed by the Koko Soul Trio! From our kitchen to your family’s table! Christmas Day includes: roast turkey, classic savoury stuffing, whipped potatoes, vegetable medley, gravy, sundried cranberry jus, traditional chocolate yule log, Christmas crackers, fresh bread, mayonnaise and cranberry jelly for Boxing Day sandwiches! Pre-order through the Festive Desk before Friday, December 15. Limited availability! 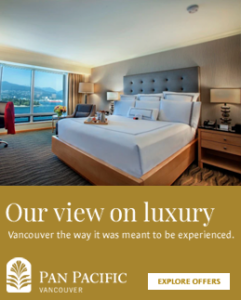 Unsurpassed views, elegant ambiance, and extravagant dinner buffet, the Pan Pacific Vancouver provides the perfect setting to say farewell to 2017 and usher in 2018. Sophisticated performances by the Burnaby Lyric Opera perfect the evening’s ambiance, followed by the music of Emily Chambers Quartet, keeping things happening until the stroke of midnight! Vancouver’s Most Celebrated New Year’s Day Brunch! Before starting those New Year’s resolutions, start the New Year with some decadence and delight with our famous New Year’s Market Brunch! With tempting selections from the buffet and soothing entertainment by the Goby Catt Trio, you’ll glide into 2018. Please note: A credit card guarantee is required for all reservations. Cancellation charge of $50 per person will apply for no shows or if cancelled within 48 hours of the reservation. For parties of 8 or more an advance deposit and 72 hours notice of cancellation is required. What about the Christmas Wish Breakfast? When is it happening this year? Hi Linda! Yes! 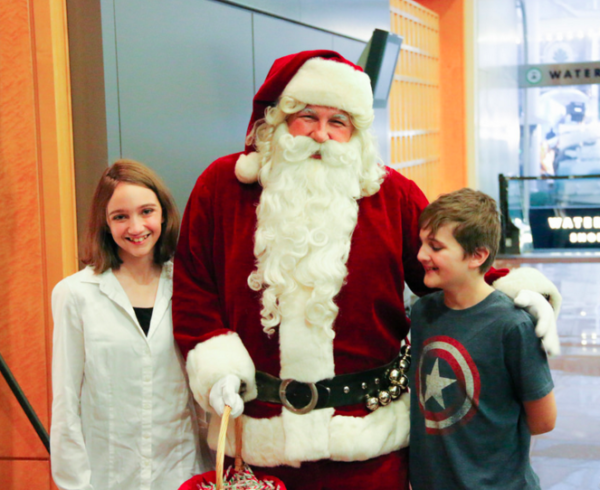 The Christmas Wish Breakfast is taking place on Wednesday, December 13, between 6am-9am.